Object attachments are an interesting phenomena in the field of paranormal investigation, and one not terribly well understood. Object attachments can range from relatively benign to incredibly harmful. Why and how a spirit may choose to attach to an object is also something we don’t fully understand either. Not all hauntings are the result of an object attachment. They are relatively common, but not always present. The majority hauntings are the result of an earthbound human spirit that is focused on a location, not a specific object. Some earthbound spirits can create object attachments, however in most cases object attachments are the result of inhuman spirits and are much more malicious in nature. Books can and have been written on the subject such as John Zaffis’s Haunted by the Things You Love. Movies have been made based on the idea, such as the completely fictional “Chucky” in the Child’s Play series, and the fictional movie Annabelle based off of a real doll with an attachment. Object attachments can really be any physical object including clothing. There is no specific pattern on what object can have an attachment. Generally speaking however object attachments are objects of some sentimental, decorative, or other nature of significant nature. That’s only as general rule however as some object attachments have been rather humble in their use and appearance such as children’s toys. Haunted objects are objects in which a human spirit has generally chosen to attach itself. This could be a spirit that won’t let go of a favorite object, a victim clinging to a murder weapon or residual spirit energy which can affect those around the object. Having such an object in a house can lead from no activity, to mild activity to severe activity depending on the spirit attached to the object. In some cases there is no activity in a location until an object is moved to another location. In those instances the spirit gets upset and makes its presence known until the object is returned to where the spirit feels belongs.These objects can prove to be troublesome, but not always. Cursed objects are a lot more sinister. These are objects in which a generally a human agent has through black magic, ritual, or other means bound an inhuman spirit to an object with the intent to harm the holder of the object. These objects are given as gifts or left with the intended victim. While in possession of these items the victim will find their life seems to be falling apart as the conjured spirit attached to the object carries out its attacks. These objects are incredibly dangerous and should be handled with extreme caution. Popo the Clown is an example of a cursed object. An imbued object is similar to a cursed object in which a spirit is bound to an object. This is usually done as the means of some form of idol worship, ritual, or conjuring. The summoned spirit, generally inhuman, will “claim” the object and create an attachment. The intent behind an imbued object is not always sinister such as the intentional harm behind a cursed object. The end results can prove to be similar however. This type of attachment could be the result of something such as an Ouija board or a statute used in ritual worship. Curiosity items seem to be some of the more common and troublesome types of attachment. 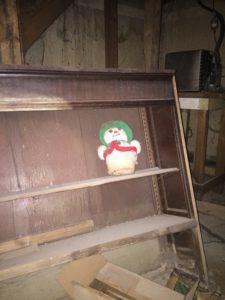 These are items at a location where a negative inhuman haunting is occurring. In these cases it is not uncommon for such a spirit at the location to attach to an interesting piece of décor, or something someone is likely to have interest in. These curiosity items then serve as a Trojan horse of sort. Someone interested in the item takes it home inadvertently inviting a negative attachment into their home. These types of attachment are also sinister in nature, however they usually aren’t as focused and targeted as a cursed item. There are certainly diverse ways and means an object can gain an attachment above are just a few of the more common. Constant research is being done on this topic. As far as how to dispose of such an object that in and of itself raises a host of issues. We at the WISPS team feel that needs to be addressed on a case by case basis. 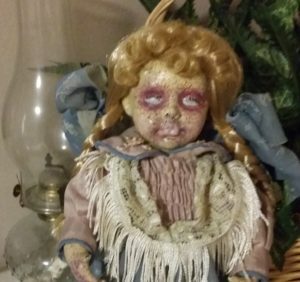 On a final note it is not uncommon to see “haunted” items for sale on such places as Ebay. Whether or not the listed item is actually haunted is impossible to tell without carefully study and investigation. Intentionally collecting and storing something like this in one’s home is ill advised and foolhardy. Only persons with considerable knowledge and experience should even be handling and storing such items.